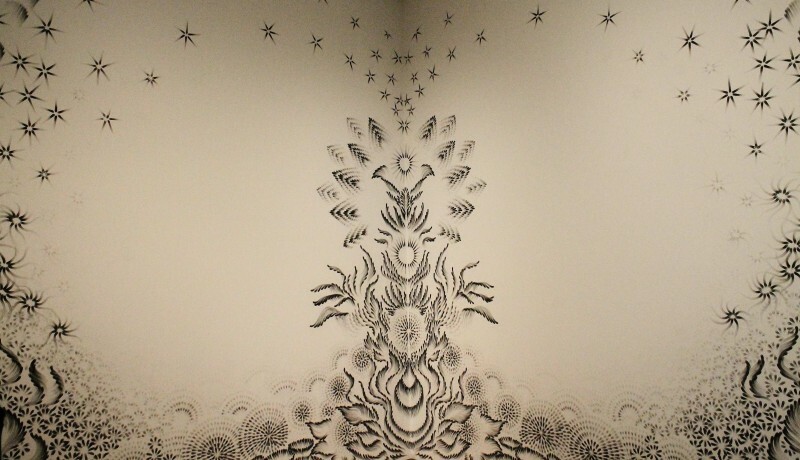 New Yorker Judith Braun created her ArtPrize Seven entry, "As Above," using a charcoal medium and her own fingerprints. "As Above," vote number 61641, can be viewed on the second floor at the Grand Rapids Art Museum during Artprize Seven. Black and white contrast filling two intersecting walls of space immediately catch the eye when walking through the Grand Rapids Art Museum (GRAM) during this year's ArtPrize Seven. Artist Judith Braun traveled from New York City at the beginning of September and created her piece, "As Above," in an impressive six days using solely charcoal and the tips of her fingers to create her 32 foot long by 15 foot high painting. Fitting into the GRAM's thematic exhibition of Nature/Nurture, Braun created an abstract landscape referencing both nature and imagination. Braun prefers to work with basic essentials, using carbon mediums and fingerprints, with a focus on symmetry. "I have reduced how I work to very basic essentials, using just my fingers," Braun explains. "Carbon is the basic building block of our bodies, and of the universe as we know it. Symmetry is also. It is central to our brain, our body, everything in nature from macro to micro. I feel like I've reduced it to these very simple elements, and then I get to invent within that. I can do anything I want with it but I've got these limitations of carbon medium, black and white and all the shades of grey." After grinding charcoal in a coffee grinder and spreading it on a paint pallet, she dips her fingers in it to begin her work directly on the white walls. For "As Above," Braun used the corner of the room as her center and then began to work outward. Although she planned ahead to some degree, Braun noted the importance of fresh work and risk, bringing creativity in the moment. "When I put my finger down, I am very focused and intentional about the curve I'm going to make, the pressure I'm going to give, when I'm going to release. That's all very deliberate, but at the same time it's a spontaneous mark. I like to keep that it's not overly measured, but it's carefully arranged," she says. "It's human and yet it's careful." Braun has been working with the idea of carbon mediums and symmetry since 2003, but started doing the large finger paintings six years ago. It began as an accident when her hands got dirty while working on a project and she touched the wall, saw the fingerprint and the potential in the gestures and pressure. Since then she completed 25 unique wall finger paintings. Each painting features a large space in order for Braun to use the full range of motion in the human body while creating her work, often climbing ladders to extend her reach. "Honestly, I'm a small, older woman. I like to be able to command a large space. For me it's a psychological challenge and accomplishment- I like to be able to do it," Braun says. 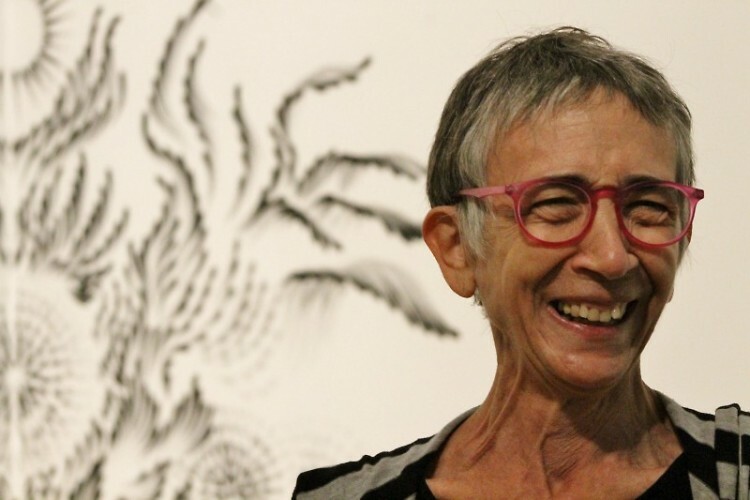 "I'm very proud of being 67 and still being on my feet having a good time, making art."